the shutter opening. A stationary engine uses a SHUTTERSTAT (long thermostatic valve) connected to the engine cooling system with hoses or pipes that allow the coolant to circulate through the valve. The temperature of the coolant, when it reaches a predetermined temperature, causes the valve to expand extending a rod which through linkage forces the shutters open. Trucks, equipped with an air brake, use a smaller thermostatic valve that actuates an air valve. This air valve allows pressure from the air tank to enter the air cylinder attached to the shutter operating mechanism, forcing the shutters open. Many cooling systems have a separate coolant reservoir or expansion tank, also called the recovery tank. It is partly filled with coolant and is connected to the overflow tube from the radiator filler neck. The coolant in the engine expands, as the engine heats up. Instead of dripping out of the overflow tube onto the ground and being lost out of the system completely, the coolant flows into the expansion tank. When the engine cools, a vacuum is created in the cooling system. The vacuum siphons some of the coolant back into the radiator from the expansion tank. In effect, a cooling system with an expansion tank is a closed cooling system (fig. 6-13). 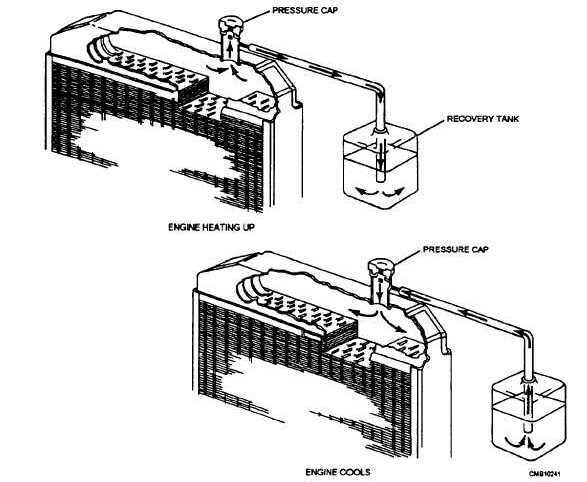 Coolant can flow back and forth between the radiator and the expansion tank. This occurs as the coolant expands and contracts from the heating and cooling. Under normal conditions, no coolant is lost. Coolant is added in this system through the expansion tank that is marked for proper coolant level. NEVER remove the cap located on the radiator unless you are positive the system is cold. If there is any pressure in the radiator, it will spray you with hot steam and coolant. Use extreme caution whenever you work around a closed cooling system. An advantage to the use of an expansion tank is that it eliminates almost all air bubbles from the cooling system. Coolant without bubbles absorbs heat better. Although the coolant level in the expansion tank goes up and down, the radiator and cooling system are kept full. This results in maximum cooling efficiency. Figure 6-13. - Closed cooling system.